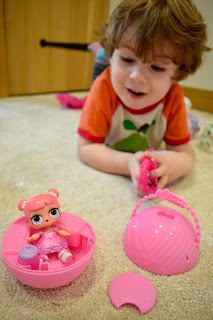 Num Noms ~ Whats Your Flavour?! 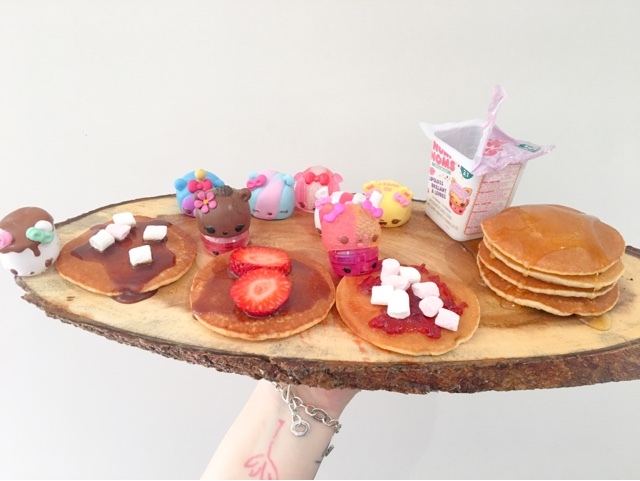 And to celebrate one of my favourite days of the year, I've teamed up with Num Noms to bring you some Num Noms inspired pancake toppings! I did plan to go all out and make the pancakes from scratch but due to lack of a non stick pan (thanks to our new oven being an induction hob, none of my old non stick pans work on it.) I did try and use one of the copper bottom plated ones but they just burnt and stuck to the pan. So I had some ready made scotch pancakes from Tesco, just incase! 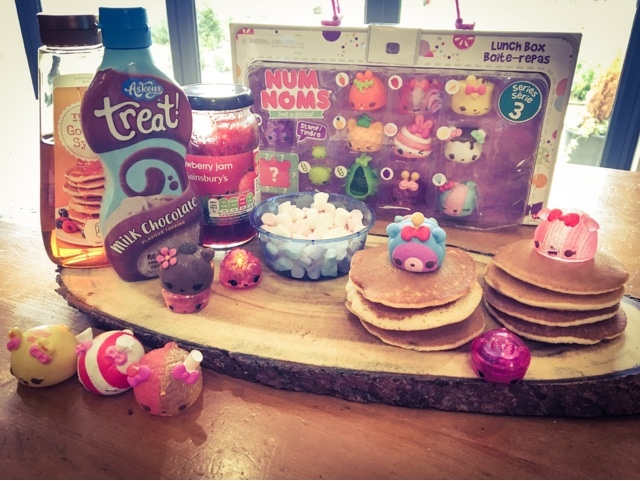 Our first Num Noms inspired topping was Chocolate sauce and mini marshmallows after Ru's favourite Num Softy Mallow. 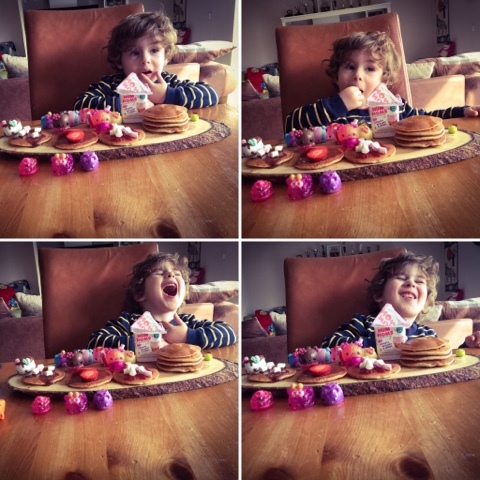 Getting him to not eat the marshmallows was tricky, but I we managed to get some on the pancakes before he scoffed the lot! Coco Cali Num and Van Berry gloss up Nom. We had lots of mini bounty bars left over from a tub of celebrations, so I decided to melt them up and spread them on. Ru wasn't really a fan but I rather enjoyed this one! 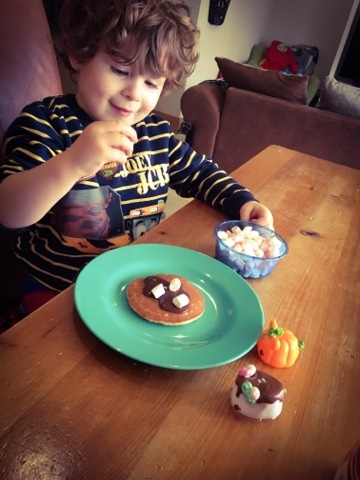 Our last pancake topping Ru picked... Raspberry Jam and Mini marshmallows. 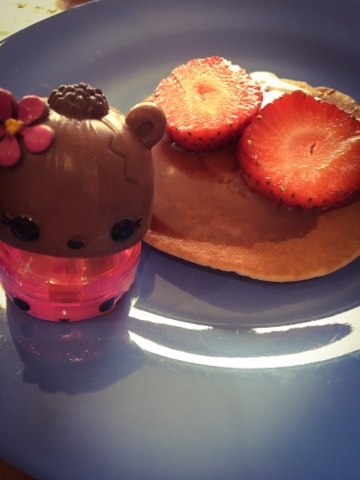 Inspired by Light up Strawberry Snow Num and choco-Razz gloss up Nom. Ru decided that he didn't care much for the jam and just ate the marshmallows. Ru had great fun trying to decided what his favourite flavour combination was. It was nice to watch him getting involved with food....something he isn't really that keen on, maybe if I covered everything in marshmallows he'd be a bit keener lol! 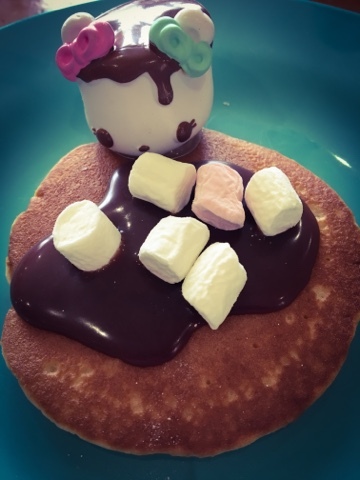 I think the chocolate spread and marshmallows was the over all winner! 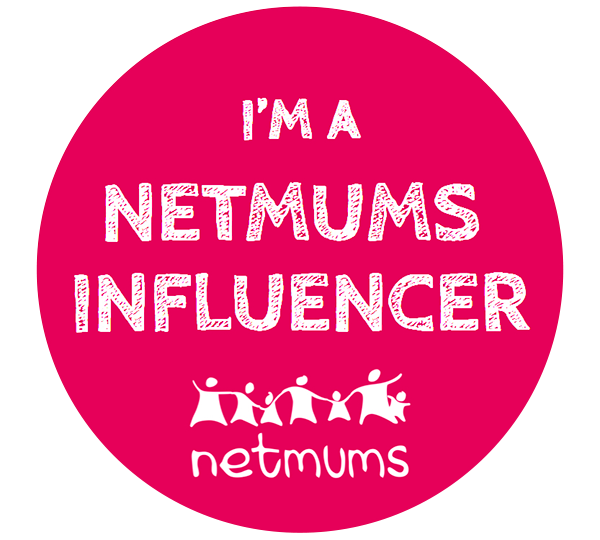 **I was sent Series 3 NumNoms and a food voucher in return for this post. For the past month or so I have been upping my exercise, as pretty much before now the only exercise I would take part in was the school run! I have been attending a local Barre Class with Jon's sister Jenni and I absolutely love it! 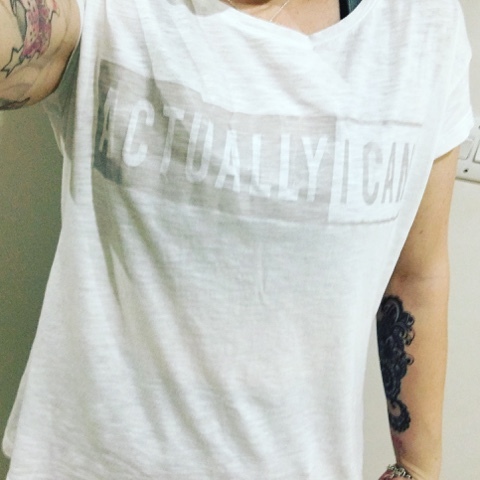 I'm already noticing changes in my body and I'm feeling much better within myself. "Most barre-based classes use a combination of postures inspired by ballet and other disciplines like yoga and Pilates. The barre is used as a prop to balance while doing exercises that focus on isometric strength training (holding your body still while you contract a specific set of muscles) combined with high reps of small range-of-motion movements." Also, don't be surprised if your class incorporates light handheld weights to bring the burn during all those reps, as well as mats for targeted core work." I usually only do one lesson a week but last week we did two and I felt even better for doing it, so I'm thinking I may start doing the Wednesday and Friday class. I've also got a bit of the exercising bug and I've started doing some Yoga at home using a free Yoga app that I downloaded from the App Store. I did my first workout last night and I've never ached so much in my life! It's a good ache and I'm looking forward to tonights workout. I used to love my gym sessions before the boys were born and you'd often find me there working up a sweat on the cross trainer and it feels good to be actually getting back my fitness. 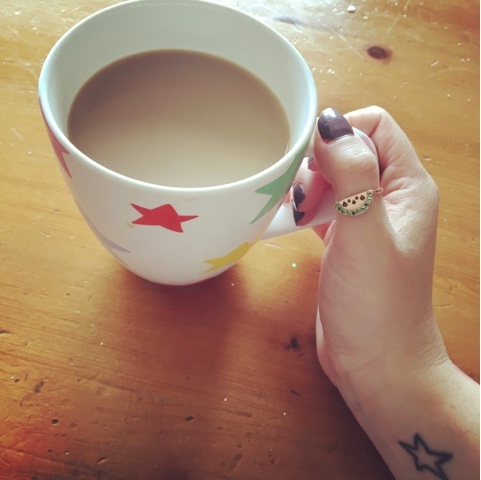 I'm no longer feeling like a couch potato, I feel like I have a bit more get up and go. 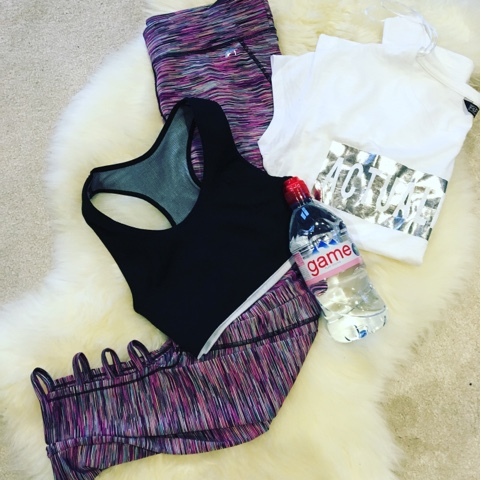 I've actually developed a slight legging obsession and find myself scrolling through sport Instagram photos looking at all the different ones I could get! I know I shouldn't really give two shoots what people think, but we all care and theirs no point in denying that. I'm hoping by summer I can feel more confident in my own skin and be happy to go swimming with the boys without wanting to hide my body away. I love everything to do with the Scandi lifestyle, as it just really appeals to me. 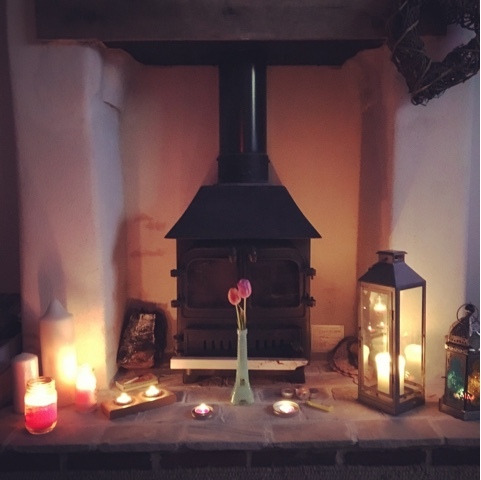 When we moved into the house we knew we really, really, really wanted to Hygge it up. This is the one room we only really use in the evenings, as we pretty much live in the kitchen during the day as that is our hub. So once the boys are all in bed...minus Ru I get a bit candle happy and light as many as I can and pop on the salt lamp. Even without the log burner on the room is instantly "Hygge". Jon and I usually cuddle up under a blanket with a warm cup of hot chocolate and enjoy watching a film. I would probably say the lounge is my most favourite room to chill out in, the no toys rule probably helps too! The twins are like most other boys and are super hero crazy! 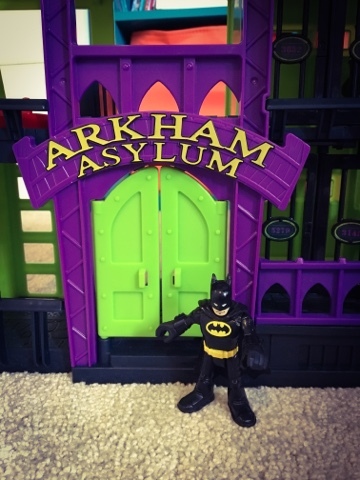 When we were asked to review the new Imaginext DC Super Friends Arkham Asylum playset I had to say yes. 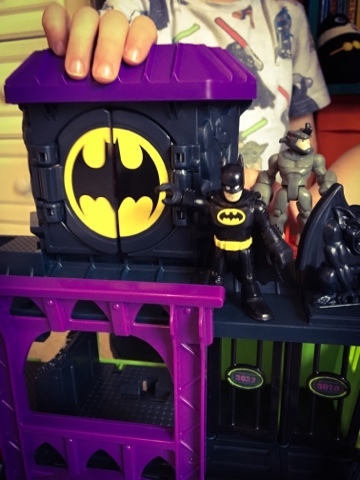 Playset includes 1 Batman figure and 3 projectiles. 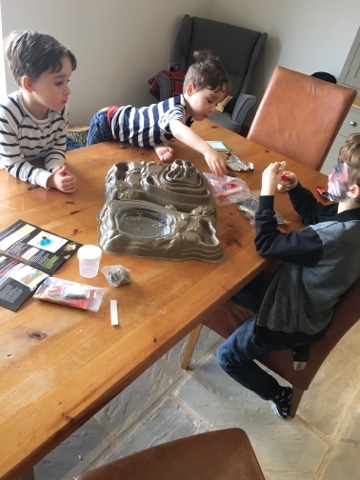 The boys jumped for joy when they came home and found the playset on the table, Oscar came so protective over it, he hid it in his cupboard whilst he was at school so that Rupert couldn't find it and put a claim to it! 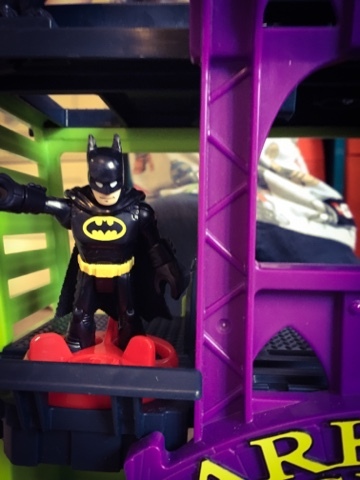 We found a few of our other imaginext figures and the boys instantly got Batman to put them all into jail. The launch pad is hidden behind the bat signal so those sneaky criminals won't notice if they are trying to escape the Asylum. With an easy push button the disks launch into the air shooting down the unsuspecting criminal, ready for Batman to go and get him and drag him back to where he belongs. 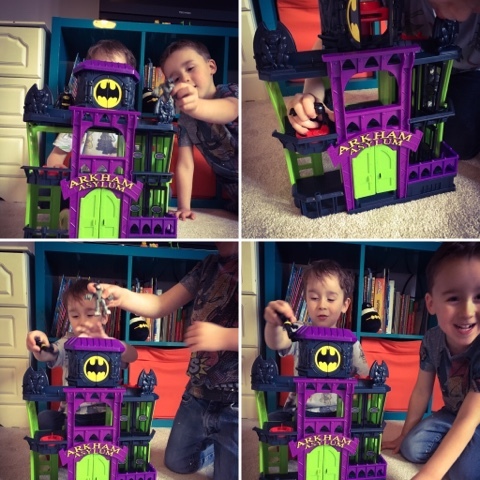 The twins took it in turns to be Batman, they each fought the baddie and got him locked up in the asylum. Sometimes the bad guy would have robbed the bank, or even stolen the worlds most famous jewels from jewel tower, one time Batman caught the baddie stealing his favourite snack! They would battle it out and if Batman won he would get to take the baddie back to Arkham and lock him up for good! 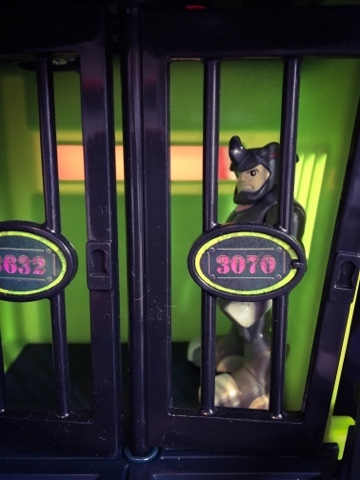 We even had poor Scooby-doo locked up in the Asylum at one point, goodness knows what he'd done to get there! 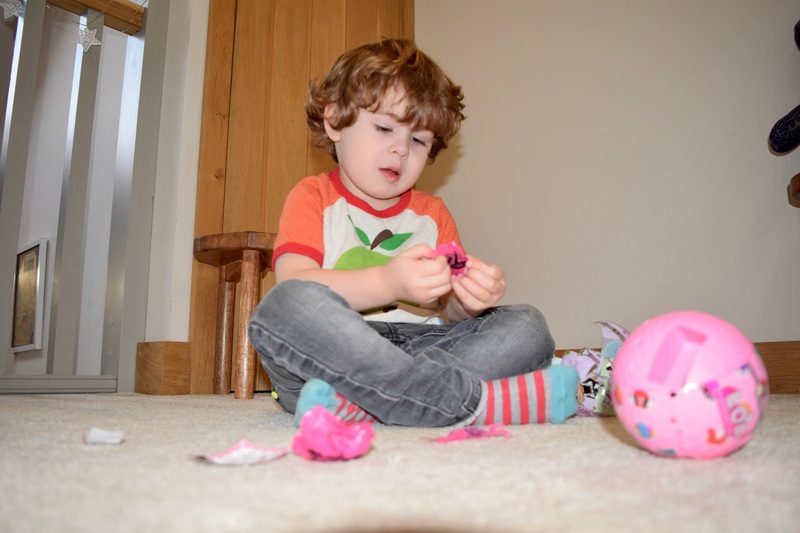 Imaginext playlets are great for letting their little imaginations run wild! 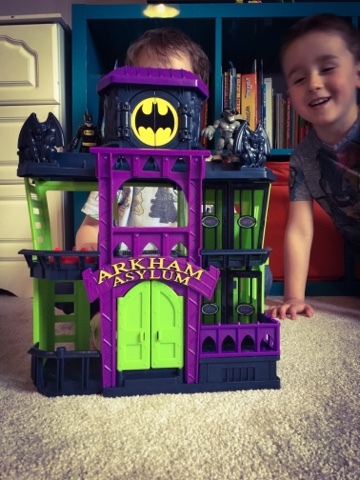 You can find the Arkham Asylum Play-set at Smyths Toys for £36.99. Here's a little clip of the boys having a play with the playset, as you can tell by their excitement they are thrilled with it. After taking the U.S by storm the L.O.L Surprise! is set to be the next collectable craze in the UK, as the ultimate unboxing toy is combined with the anticipation of surprise! 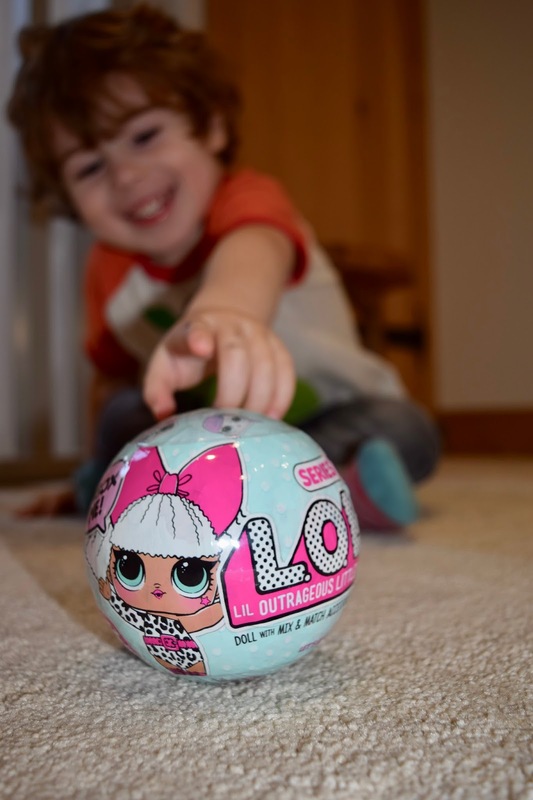 Much like unwrapping a gift, watch the excitement build as each 7 layers reveal a different surprise, including emoji stickers, accessory, and finally their hero - a L.O.L Surprise doll. 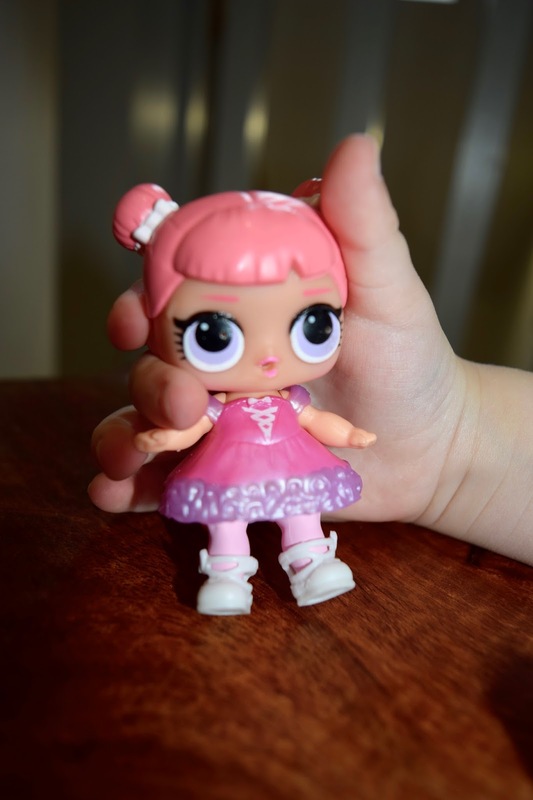 Not you average doll, these fashion forward characters are packed with personality. From Rockers to Merbabies, each L.OL Surprise! comes complete with bathtub, doll stand and hangout, all doubling up as a purse. 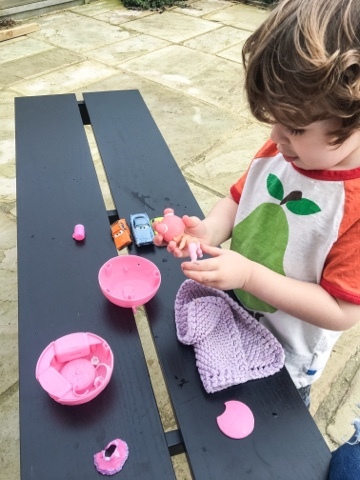 But the surprise doesn't end there, once the final layer has been unwrapped, feed the adorable tot water with its baby bottle and reveal its feature - with special dolls changing colour when placed in cold water! We unboxed the fabulous Centre Stage. 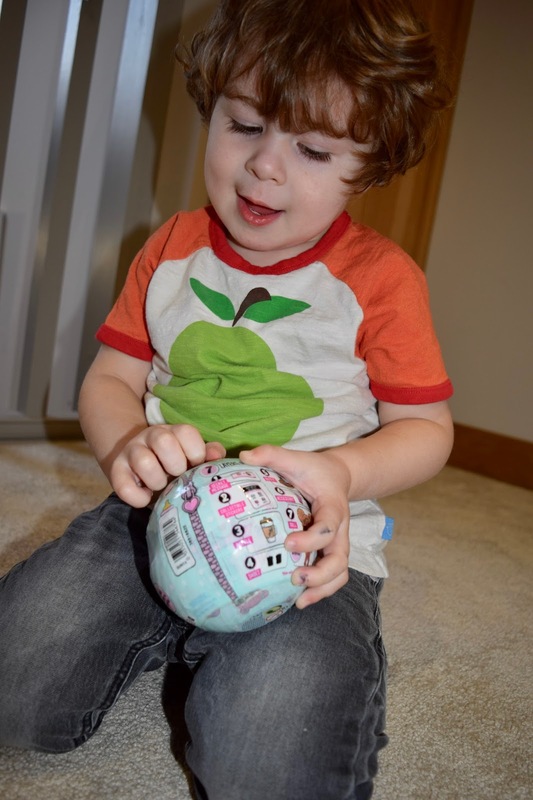 Ru loved unwrapping all the packaging and finding the little surprises. He instantly fell in love with his doll and after I showed him that you could feed her and bath her he was over the moon. He took her into the garden and pretty much played with her all day! I can see these snazzy dolls becoming a thing for him! including Argos, Asda, The Entertainer, Smyths, Tesco and ToysRUS. Weekends are family time and there's no better way than spending an afternoon than playing games together. We were recently sent a bundle of board games from Esdevium Games to work out way through. 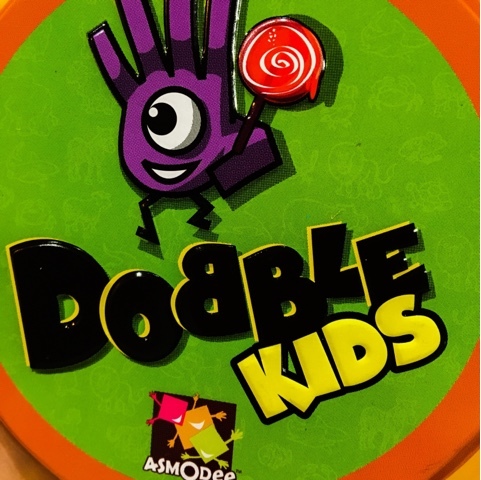 The first picked was Dobble Kids, which you can buy from Amazon for £11.94. 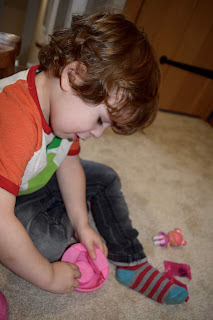 A fun fast moving matching game. 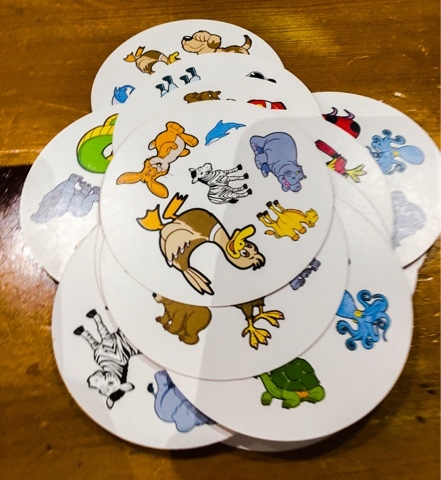 Find the one matching animal from your card and the other cards in the game. To win, find it before anyone else does! There 5 games in 1 tin. The main game and 4 mini ones, which are perfect for the younger players of the group. I played this with Alex whilst Oscar was in hospital and he loved it! So when it came to playing all together he was already a pro at it, and even gave Noah aka Mr Bad Loser a run for his money. 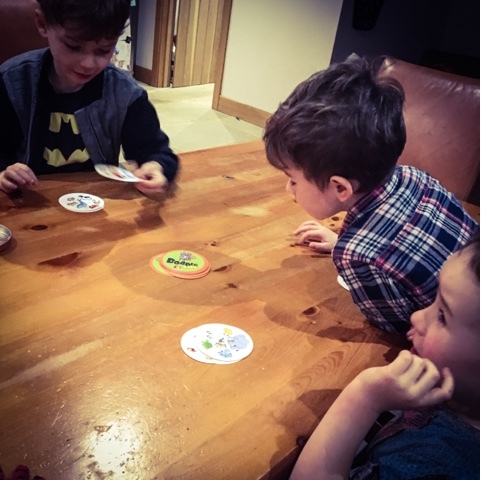 The Mini games are not as fast paced as the original so if you have a child who isn't as confident at being able to spot things quickly these games will be right up their street. The boys give Dobble 5 out of 5. 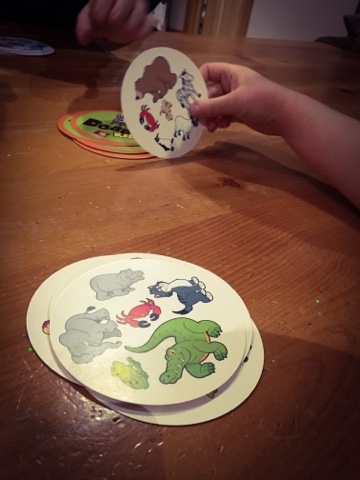 They loved trying to find the matching animals and ended up in fits of giggles when the other didn't quite manage to do it before them. 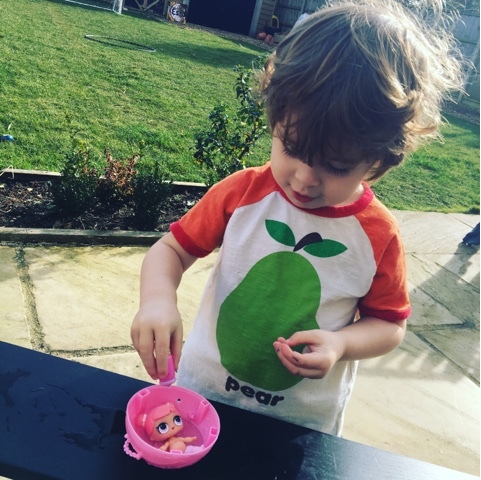 The twins have really gotten the hang of the game and enjoy playing it between themselves, which they prefer as they always think Noah cheats! A super easy and fun family game that I can see being played most weekends. 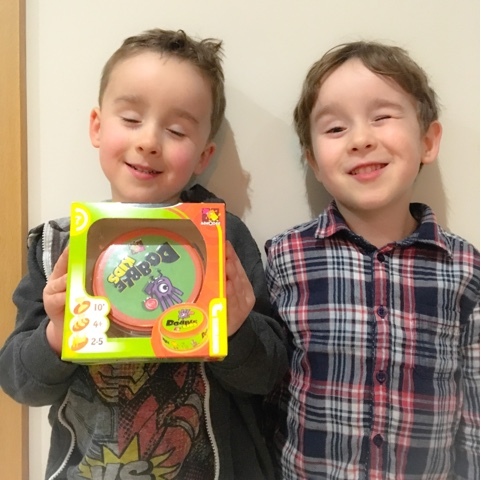 If you fancy the chance of winning Dobble Kids for yourself why not enter my Rafflecopter giveaway! Winner will have 24hr to reply before another winner is picked. 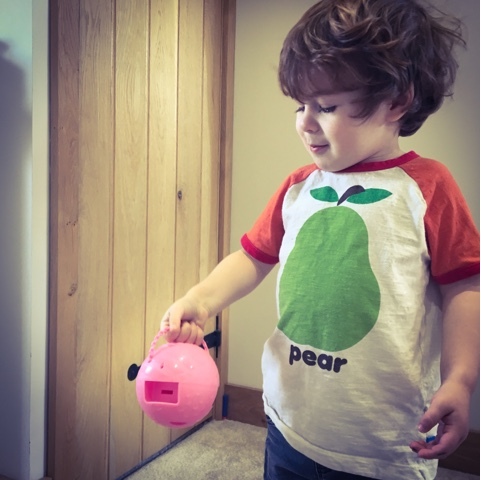 We were recently contacted by Gubbo, a new brand in the world of kids design and products for modern parents. 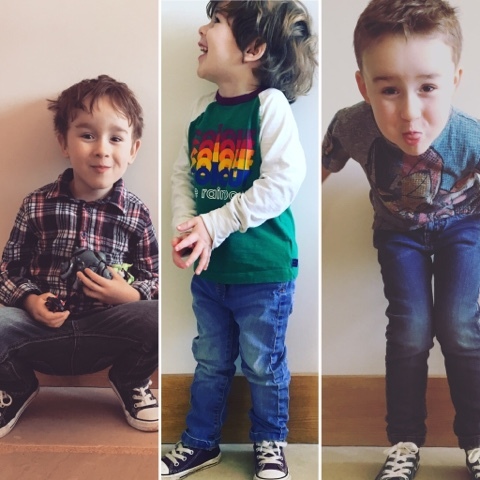 Asking if we wanted to try out one of their super cute Cheeky Monkey balaclava. Ru is a bit hat fan so I knew he'd be more than happy to add another one to his collection. 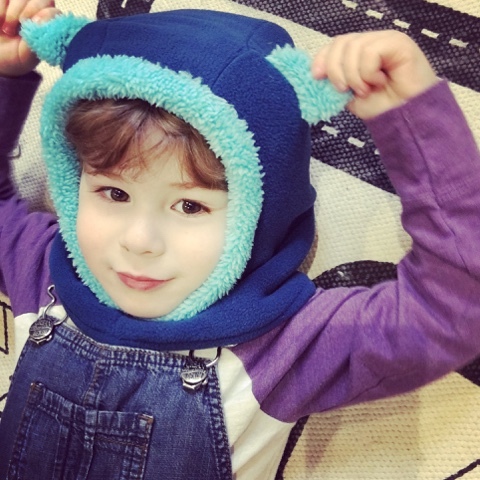 The hat is made of Polar Thermal Micro Fleece with a double material layer textile construction. 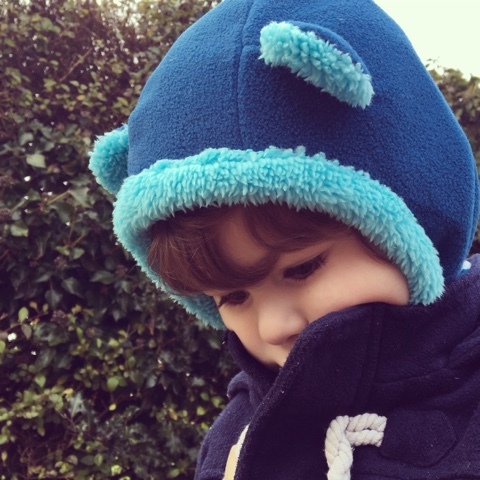 It is also breathable so your little ones head won't get too toasty! Ru loved it so much he put it on as soon as he saw it. Its a hat, scarf and face mask all in one! 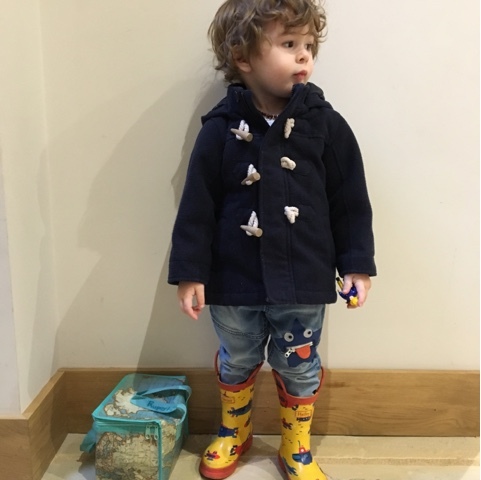 Perfect for cold days, and much safer than handing a scarf to a toddler! You can buy the hat in either pink or blue from the Gubbo website for £19.99. As Gubbo are still pretty new they only have the cheeky monkey balaclava's for sale, but there are new products in the pipeline!! As well as being sent the hat, we were sent a goodie box full of organic treats, which the boys a matter of seconds to start tucking into. After Oscar spending the week before half term in hospital we knew we weren't going to be getting up to anything too excited but we tried to make the most of the week. 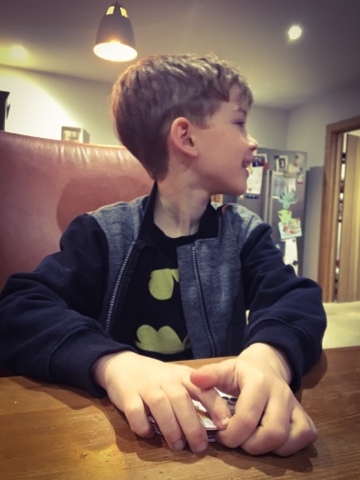 On Tuesday Rupert had his first full day at nursery so I decided to take Noah and the twins to the cinema to watch the new Lego Batman Movie. Oscar started out ok, but within 20 minutes of the film starting he wanted to go home, I text Jon to come and rescue him and as soon as Oscar got back to the car he was sick. Noah and Alex loved the film and have already demanded I buy it on dvd as soon as its out! Poor Oscar spent the rest of the day asleep. 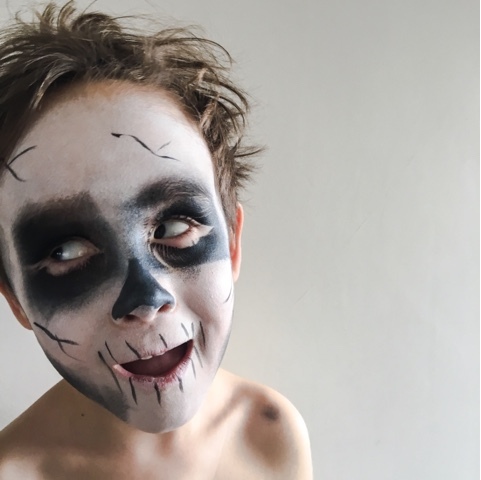 Rupert had another full day at nursery on the Wednesday, so whilst he was out we stayed in and I practised my face painting skills. 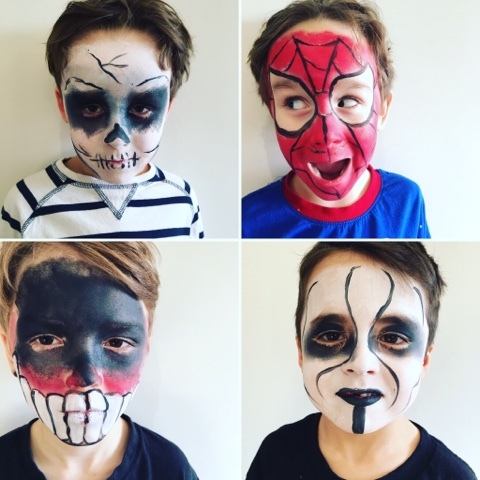 We had Sam round so the boys were pretty busy entertaining themselves after I had finished painting their faces. Oscar again spent most of the afternoon laying on the sofa. We also cracked out Noah's Land of Dinosaurs kit which he was sent from Clementoni Toys. The boys all loved watching the volcano explode and planting up the seeds. We are now on daily seed watch and noting down any changes that we see. 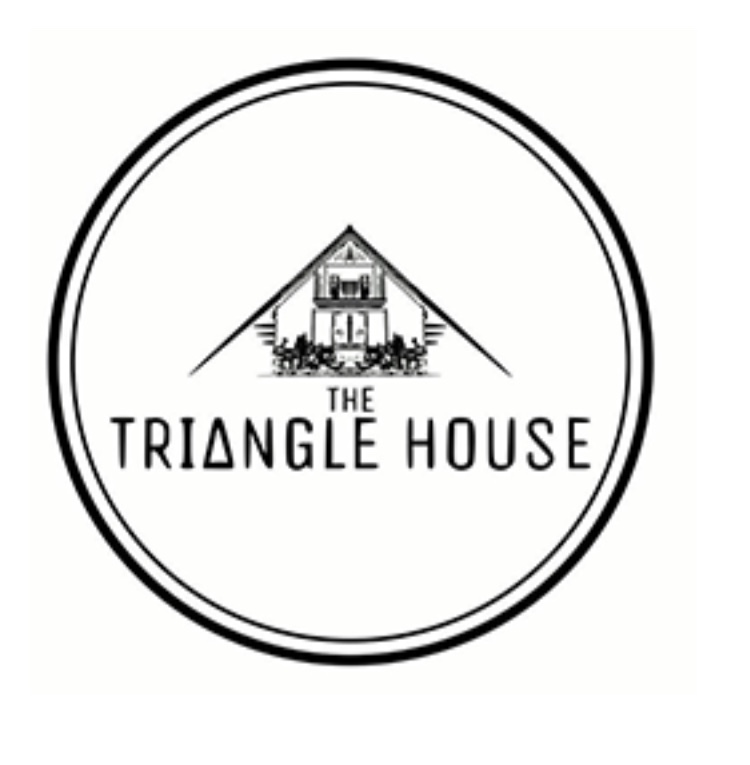 I will be doing a whole post on the kit so keep an eye out. Rupert is still being a massive pain in the bum by not sleeping. He's been getting up at 3am every day since I've been back from hospital and to say I'm running on empty is a little bit of an understatement. We have met our new Health Visitor and told her all about his issues and she is going to come back in a few weeks with another lady and see if they can both help us tackle it. 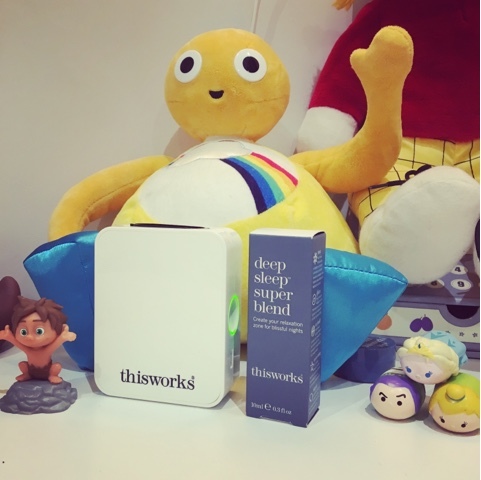 My mum sent me this diffuser from ThisWorks.....so far it hasn't had much of an effect other than making his room smell gorgeous. I will stick with it as it might click in his head that, that scent is associated with bedtime. I'm also thinking about getting him a single bed, as he won't come and get into our bed, not without a fight anyway and I always end up sleeping on his floor....which is resulting in my hip starting to hurt and me not getting any sleep. If he had a bed that I could fit in as well as him it might help my lack of sleep and he'll be happy because I'm there with him. 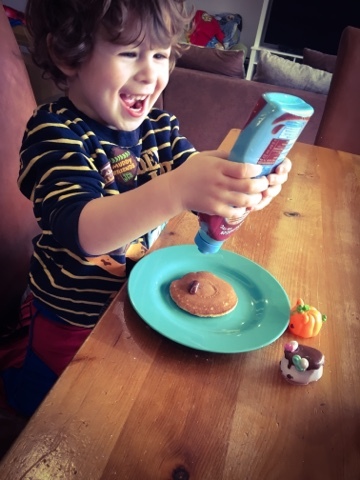 By Friday we did some more face painting and a little baking. 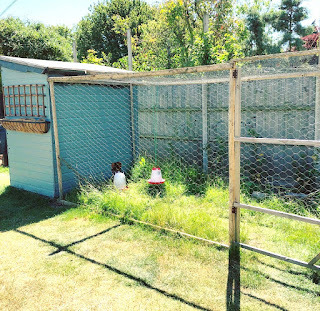 The weather was pretty good over the half term so the boys were all able to play in the garden when they wanted. Oscar has gone back to school today but he's still not 100% back to normal. 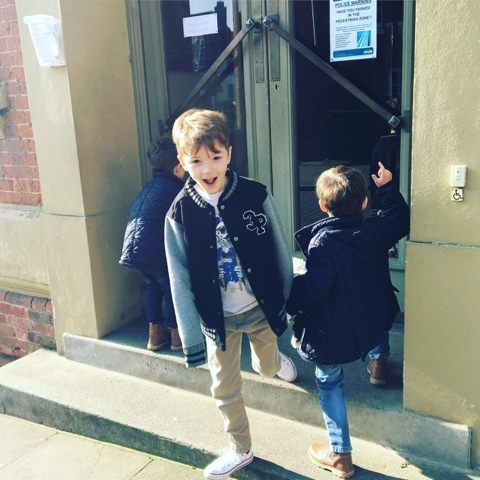 I went in early today to talk to the head teacher and his teachers and they are all happy to see him back and have said if he needs a rest he can have a lay down or they'll call me to come and collect him. Today we decided to test the waters and see how Oscar handled going out for the first time in a few days. It's back to school tomorrow and we still aren't 100% sure if he's well enough to go back. 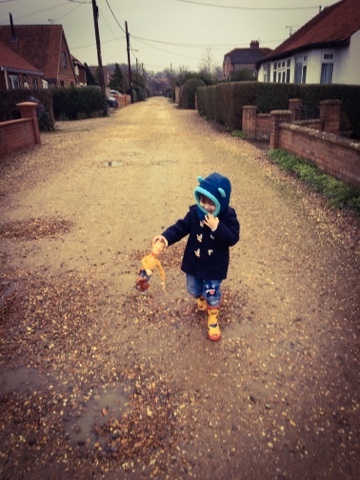 A trip to feed the ducks and a play in the park seemed like a perfect way to test the waters. After we spent the morning breaking up our stale bread we dropped Noah off at Sam's (withdrawal symptoms had kicked in) and we headed off to the duck pond. The ducks here are really friendly and as soon as you step out the car they are heading towards you to see what you have bought them. The boys loved watched them gobble up the bread, I'm sure Ru wanted to try and stroke some of them at one point. Once the bread was gone, we sat and watched them for a little bit longer and then headed off to the park, which is just around the corner from the duck pond. They all had fun and Oscar handled it well, though he's taken himself off to the quiet room to have a lay down, so we shall see how tomorrow goes! Making The Best Room For The Kids!